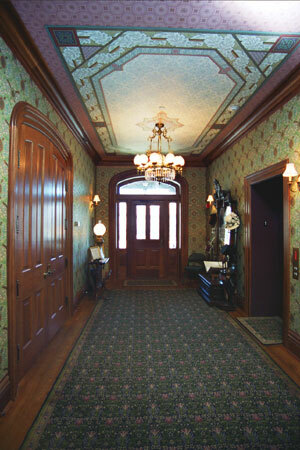 In the United States, interior design styles and architectural styles were not strictly equivalent during the second half of the nineteenth century. In addition, many houses had been significantly altered over time to incorporate newer design trends as their owners became more affluent. During the 1870's, Americans continued to cover their walls with ever-increasing quantities of paper. Wallpaper was no longer consider a finish; it became an essential part of a room's overall design. However, their taste in wallpapers was changing. They were often less attracted to the French designs, featuring trompe l'oiel effects because they were beginning to heed English design reform theory and to buy English-made wallpapers in which the application of that theory was evident. Most notable of the English wallpaper designers was William Morris. His wallpaper designs were, above all, foliate with sinuous trails of foliage with fruit or flowers creating a dense overall pattern. The realism with which Morris flowers and foliage were drawn contrasted sharply with the earlier more geometric or abstracted designs. 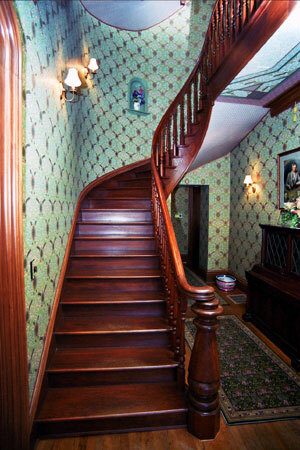 A Morris and Co. brochure stated that wallpaper was simply to be a filling for the "natural architectural features of a room" and added that "our wallpapers imitate neither dado, frieze, nor paneling", hence the use of one overall pattern from cornice to floorboard in the stairhall. William Morris felt that it was important to bring the outdoors (flowers & foliage) into the home, thus this historic pattern seemed to be most appropriate for the entrance foyer. The mixture of patterns in the wallpapers and carpets was very prolific in the Victorian period which encompass many Victorian styles. The ceiling represents the naturalistic designs and includes a classical reference of acanthus leaves used to create an oval wreath surrounding the ceiling. Knightbridge Damask. American Victorian revival, 1880. Designed by S. J. Bauer in the style of William Morris; authentic to the period. Westwind Enrichment. American, 1870-1890, originally machine print. Acanthus Border. English, 1875-1890. 9" wide, adapted from stencil designed by Morris and Co.
Kensington Ceiling. American Victorian revival, 1880. Designed by S. J. Bauer. Leaf Border. English, 1875-1890. Adapted from stencil work by Morris and Co.